Earlier this year I got my first tattoo. It took awhile to work up the courage. I researched online, made and cancelled appointments, and quizzed friends about their experiences. Finally I realized that I more often regret things I have not done rather than things that I have. I found a tattoo artist I could trust (thanks Darren at Rising Tide), asked a few friends to nominate songs for a mixtape to play during the process, and showed up for my appointment with ipod in hand and heart beating fast. After sitting a few minutes in the waiting room, a voice called out for help. It came from the tattoo artist in a nearby booth. His buff young customer had fainted. Hmmmm. In entertaining anxieties about what could go wrong, I hadn’t even considered passing out. Fortunately Darren got me into his booth shortly after he answered the call for help. It turns out I never clicked “play” on my ipod. Before long he and I were engaged in conversation. A lot of pretense disappears when one person pushes inked needles into the willingly-offered arm of another. We covered lots of topics but mostly we talked about art. What a treat to compare notes with a fellow artist working in a very different medium. Darren and I talked about the kind of art we most like to create and discussed the pros and cons of large versus small art projects. We shared ideas about keeping artistic passion alive while making the concessions necessary to earn a living. The discussion covered much common ground and also uncovered thought-provoking differences. Moreover, I got to have this conversation primarily from the perspective of a buyer of custom art. I create custom art often– gifts to mark major life events, memorials and urns for beloved pets. 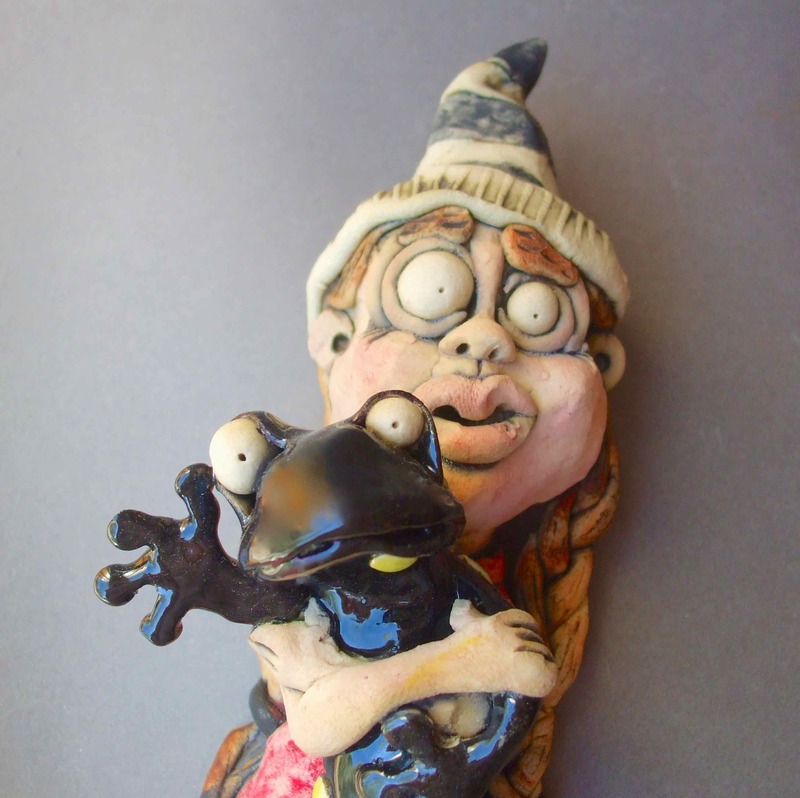 And although I make a lot of custom sculptures, I don’t often commission art from other artists. A few mugs but never a personally meaningful piece. And here I was, getting a made-to-order tattoo on my arm. One glaring difference between custom sculptures and custom tattoos is that when I work, only the wandering eyes of my studio-mate chameleon are upon me (and sometimes only one eye at that). A tattoo artist creates her or his custom art under the watchful gaze of the customer and in a charged environment with endorphins flowing and customers occasionally falling to the floor. Despite the differences, I learned some important lessons on custom art from my first tattoo. Many of my friends without tattoos tell me they want one, but can’t decide what to get. Me, I knew exactly what I wanted. 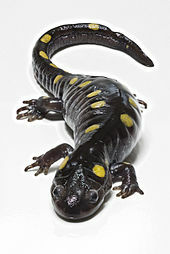 A yellow spotted salamander. This tattoo has layers of meaning for me. There’s the personal significance of the creature. As a kid I turned over thousands of rocks in the Pennsylvania forests but only once did I uncover a beautiful, plump, yellow spotted salamander. It reminds me that wonderful treasures lie in wait for those who do the work. There’s also the symbolism of salamanders in general, amphibious creatures thought to be born of fire. And there are the cultural associations of tattoos with toughness and rebellion. Also transformation through pain. Lots of layers of meaning. I showed up at my pre-tattoo consultation with very clear ideas about what I wanted and gave Darren my carefully-chosen images. When I went in for the actual tattoo a week later, I was shocked. The planned tattoo was really BIG. A lot bigger than I expected. Darren had told me that larger tattoos allow better detail and last longer. My first priority was that the tattoo look great but I wanted my first tattoo to be as small as possible. Had I not been clear enough about the “small” part? The tattoo Darren designed would not allow me to emerge from the tattoo booth unchanged. This would not be a tiny late-life tat hidden in an inconspicuous spot. I was going to be a tattooed lady. Darren offered to redraw the tattoo smaller. Some voice that sounded a lot like mine declined the offer. The whole process was supposed to be about transformation, that annoying voice reminded me silently. Besides, my research suggested that people usually did not regret getting their first tattoo; rather they wished they had gone bigger. Well, it was looking as if I would not have that particular regret. Darren transferred the stencil onto my arm. Not only was it BIG (which I believe I may have mentioned already), it didn’t sit as I had hoped. I wanted the eyes of the salamander to make contact with my own. Instead, the salamander peered at my collarbone. And I had hoped I could hide the tattoo under a short-sleeved shirt should I choose. Given the size, it was going to have to sit higher. So Darren repositioned the image a little. It still didn’t make eye contact and the tail still hung low. Darren was reluctant to shift it more. 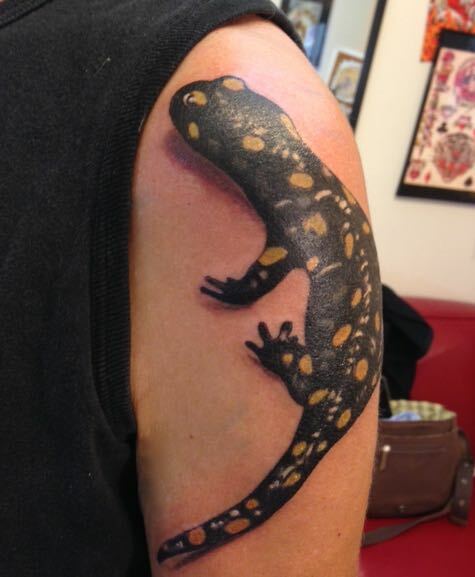 He said the salamander would not sit nicely on my arm if he moved it more. What to do? I was going to have this tattoo for the rest of my life. I didn’t want to acquiesce on something important just because I didn’t want to seem difficult. I had researched my artist carefully, waited many months for my appointment, and trusted him. Instead of insisting on more changes, I decided to fall back on that trust. It’s been a few months now and I can honestly say I LOVE my first tattoo. Even the size pleases me. I have adapted to my new identity as a tattooed lady. Sure, there are people much more tattooed than me but I’m talking about self-identity here. When I see heavily tattooed people, I now smile a smile of kinship. They probably have no idea why I’m smiling, but they usually smile back. The positioning of the tattoo is a bit of a compromise. The salamander doesn’t make eye contact with me nor does it sit exactly right on my arm from a purely aesthetic point of view. But I’m okay with that. The compromise of its positioning just adds another layer onto all the other meanings of this tattoo. It reminds me to be clear about my ideas and also to trust other perspectives. Getting my first tattoo gave me insights about my responsibility as an artist. Commissioning art is an act of trust and I feel renewed gratitude to the many customers who have entrusted me with their projects. I have also become much more comfortable offering my artist’s perspective. The customer can weigh my artistic advice along with their ideas of what is personally meaningful to help design a work that achieves a balance of between aesthetics and meaning.